As part of the half-day workshop, I got to dye a silk scarf with a dye of my choice. 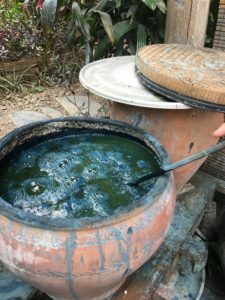 I love green hues and wanted to make a dye from start to finish, so I chose to dye my scarf ‘indigo’ green. This was, apart from some pretty intense pounding of leaves, surprisingly easy. 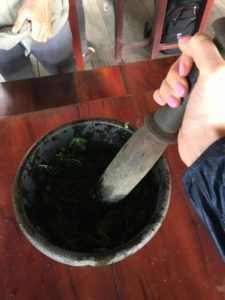 I got to pick freshPersicaria tinctoria leaves in the beautiful garden, washed them, and mashed them vigorously in a mortar for about five minutes. 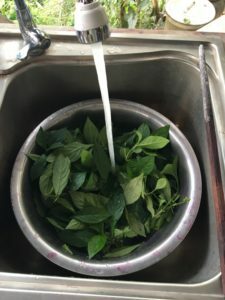 Then I transferred the mashed leaves into a tub, added some cold water and then the raw silk scarf. After kneading the dye into the fabric for a couple of minutes, I could rinse my scarf and hang it to dry. 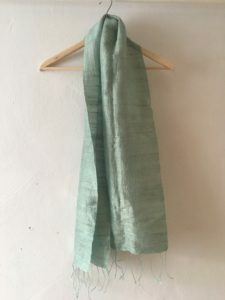 The end result is a beautiful soft green scarf, that is not just a souvenir, but a tangible reminder of the traditional Laotian knowledge about natural dyes preserved and shared at Ock Pop Tock.